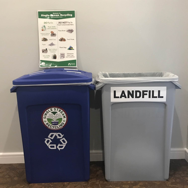 Recycling at Ramapo College is now easier than ever! Through the use of the Single Stream Recycling program, we have eliminated the tedious and troublesome factors related to recycling. Time is no longer wasted by sorting recyclables and separate pick-up days. All materials collected for recycling are now non-sorted in one blue bin. In addition to ease of participation, this approach also delivers added efficiency by reducing vehicle miles for collection trucks and related tailpipe emissions. Every classroom, lab, studio, office and event space is equipped with two containers. The Blue container, labeled “Single Stream Recycling,” is for all accepted recyclables. These include glass plastics, metals, cardboard and paper. All recyclables must be empty and free of liquids or food debris. All other waste must be placed in the Gray containers, marked “Landfill”. This includes all food waste, contaminated recyclables and garbage. Pizza Boxes are not currently recyclable, and MUST be put in the container marked Landfill. Empty all liquids and foods from containers being recycled. No Straws in cups being recycled. Electronics – Computers, Mini Refrigerators, Televisions, Audio Equipment, Printers. Contact ITS (x7777) for disposal of computer equipment and put in a work order with the Office of Facilities (x7660) for all other electronic material.